Publisher: The Hudson's Bay Record Society, London. Copyright Holder: Expired; no restrictions on use. Please credit HBCA - Archives of Manitoba. James Knight (c. 1640-c. 1720) first entered the Hudson's Bay Company's service in 1676, and rose from being a shipwright to being Governor of the Bottom of the Bay before retiring in 1700. He was a shareholder as well as a servant of the Company, and sat on the Committee in London after he left the Bay. He resigned from the Committee and came out of retirement in 1714, when the HBC sent him to receive York Factory back from the French (according to the Treaty of Utrecht, signed the previous year between England and France). In this letter to the London Committee from York Fort, Knight mentions an expedition undertaken by HBC servant William Stewart and a Dene woman usually known as Thanadelthur to make peace between the Cree and the Dene. Although there is no doubt that Stewart (and all his companions) endured great hardship on their difficult journey, Stewart's account of the peace mission clearly portrayed Thanadelthur as the most important member of the expedition. September 17, 1716, p63, 2nd pgh: "William Stewart... Churchill River." 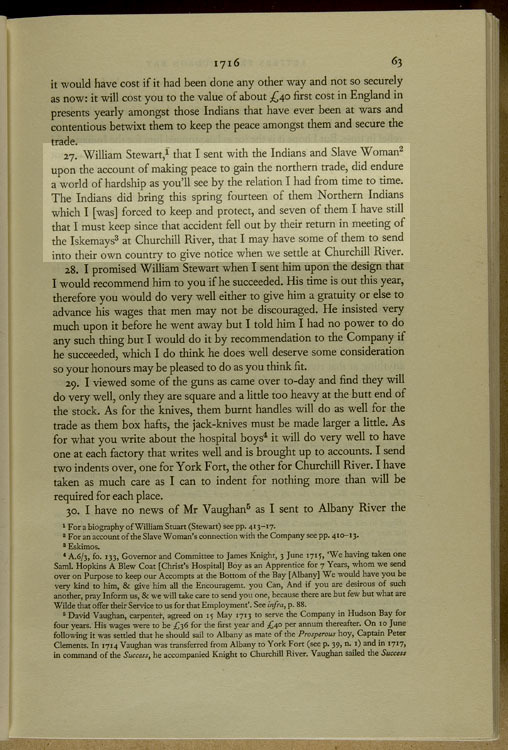 "William Stewart, that I sent with the Indians and Slave Woman upon the account of making peace to gain the northern trade, did endure a world of hardship as you'll see by the relation I had from time to time. The Indians did bring this spring fourteen of them Northern Indians which I [was] forced to keep and protect, and seven of them I have still that I must keep since that accident fell out by their return in meeting of the Iskemays at Churchill River, that I may have some of them to send into their own country to give notice when we settle at Churchill River." Thanadelthur was a Dene woman taken prisoner by the Lowland Cree: she escaped from the Cree and eventually made her way to York Factory, where James Knight decided to use her as an interpreter and go-between with her people. Knight only ever referred to her as "the Slave Woman," probably meaning that she had been a slave of the Cree: the name "Thanadelthur" is the name given to her in Dene oral tradition.